Workers at McDonald’s and other fast food industries have been whining lately that they deserve a $15/hr minimum wage. Now it appears that if that happens, the human workers might get replaced by robots. 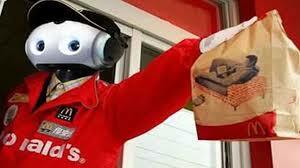 It would seem that that at McDonald’s, a robot staffer is cheaper than a malcontent human one. I bet the robots can make change as well and have a better attitude. Who would have thought they were cheaper? Hmm, I did. For years I have been saying, the more folks whine about getting a “living wage” of $15 per hour, they more they would be replaced by machine. A former McDonald’s CEO is warning that robots will take over jobs at the huge enterprise – because it’s cheaper than employing humans. He said that buying highly skilled robotics is cheaper than employing people at the fast food restaurant. The worrying forecast comes as he warns huge job losses are imminent, and that it’s ‘common sense’ to replace humans in the workplace. I think the exact words of warning to those complaining about wanting their pay to be doubled for doing a job that required little to no skill level was the following. By the way, minimum was meant to be a starter job, not your destination and to afford a home and children. A note to the “Fight for 15? crowd … DON’T ASK FOR THINGS THEY MIGHT COME TRUE. If this BS is actually passed, all of you making $7.25 will most likely be fired and more competent people worthy of $15/hr will be taking your place. Or, if it were me I would automate the system and completely eliminate your position. How difficult would it be to replace order takers with kiosks both inside and outside to go? And sliding your credit or debit card into a machine to pay like at a gas station? Actually, I am surprised this has not been completely done already. 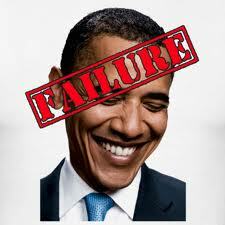 Barack Obama, the Outsourcer in Chief is at it again. So what does an incumbent, hypocrite President do who is in trouble on the domestic front with the economy, jobs and debt, and who continuously ans falsely attacks his opponent Mitt Romney on outsourcing do … why Obama outsources his campaign with fundraisers in Switzerland, Sweden, Paris and Communist China of course. Check out the Gateway Pundit for all the specifics and details for Obama’s fund raising in Switzerland, Sweden, Paris and Communist China. Who finsd it just a wee-bit ironic and laughable that Obama, whose campaign has attacked Romney for Swiss bank accounts, is having a fund raiser in Switzerland? 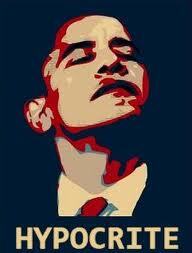 I wonder how many of those Obama donors have Swiss bank accounts themselves? Just curious, with the advent of the Internet, Paypal, and on-line donations, why would a campaign really have to go to foreign countries to to get campaign funds from Americans living abroad? 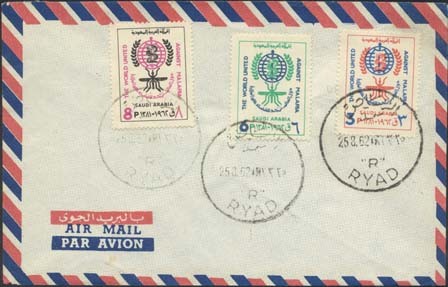 There still is International mail with those “par avion” letters that individuals can send a check, right? Better yet, as stated at I’m 41, begging for donations in Red China, really? 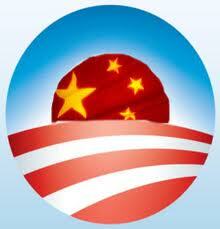 Check out the link to the Shanghai beg from the official Elect Barack Obama/Biden web page. Of course all of the donations funds come from Americans living abroad, wink, wink, nod, nod. If both candidates hold fundraisers overseas as we are told, one has to answer two following questions, one, why is there a huge difference in donations and two, if outsourcing is so bad, why is Obama going after monies from Americans living and working abroad? 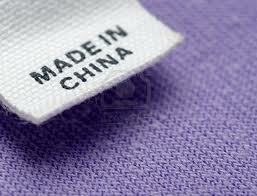 Look for that union Chinese label … C’mon man, you mean we can’t even make the damn USA Olympic uniforms in the USA? File this one under, imagine what the news cycle would be like if it were a Romney donor? You just can’t make this stuff up … President is so quick to attack Mitt Romney for outsourcing jobs, but mums the word when it comes to the USA Olympic uniforms that were outsourced to China to be manufactured by an Obama donor’s company. That donor, Ralph Lauren of course. Not only will USA Olympic athletes be walking in the opening ceremonies of the London Olympics in cheesy outfits, but ones made in China. Why not seeing that they own so much of our debt. Under this President I am surprised we are not made to wear the same outfits as the Chinese. Can you imagine what the MSM would be screaming if it were Bain Capital that outsourced the USA Olympic uniforms to China? The company who designed the uniforms, Ralph Lauren, has received less scrutiny. Few outlets have noted that Ralph Lauren himself is a prominent contributor to President Obama and the Democratic Party. According to the Center for Responsive Politics, Lauren has given $7,300 to Obama since 2008, and more than $35,000 to the Democratic National Committee. Harry Reid says the uniforms should be put in a pile and burned, what about the campaign donations as well? Senate Democrats Introducing ‘Team USA Made in America Act of 2012? but no word on whether they will return the donations from the outsourcing donor. No word from Senate Majority Leader Harry Reid about still wanting to burn the uniforms outsourced to China by a Democrat donor. “I think they should take all the uniforms, put them in a big pile and burn them and start all over again,” Senate Majority Leader Harry Reid, D-Nev., said when asked by ABC News Thursday. “If they have to wear nothing but a singlet that says USA on it, painted by hand, that is what they should wear. From Michelle Malkin.com, how come President Obama is not ripping Ralph Lauren over outsourcing jobs to China and especially the manufacturing of the USA Olympic outfits? Hmm? Oh, looky there, could it be those nice donations? Where is the hue & cry to give back this money? While we are on the topic of outsourcing and shipping jobs to China, where is the liberal, corrupt MSM complex and their reports of Barack Obama’s jobs czar, GE’s Jeff Immelt, who gets a massive tax break from Obama, yet shipped thousands of jobs over to China?